A Sydney woman says her profoundly disabled brother could be left without a permanent home in three weeks because of serious flaws in the National Disability Insurance Scheme (NDIS) in New South Wales. Nisha Letchumykanthan's brother Anojan is severely autistic. She said he was being evicted from a purpose-built group home because the provider that runs it, House With No Steps, had decided his behaviour had become too challenging. Ms Letchumykanthan has spent the past nine months looking for alternative housing and said no charity, or even the NDIS, had been able to help. "No-one had a suitable arrangement for Anojan because of his challenging nature and the housing market," she said. "What's going to happen to Anojan? Where's he going to live? Is he going to be homeless on the street?" The Public Service Association said the case typified flaws in the NSW Government's agreement with the NDIS because there was no contingency for housing people when the free market failed. It said the NSW Government had "abrogated" itself of its responsibility for people with a disability by completely selling off its disability services and failing to ensure there were State Government group homes for difficult cases. NSW Public Service Association assistant general secretary Troy Wright said NSW was the only state with such an agreement. "It's quite radical and it's leaving an enormous gap in services for families such as this," he said. "We predict a lot more of these cases will come to pass. The State Government desperately needs to revise its strategy." Following inquiries from the ABC, not-for-profit organisation House With No Steps said it would not put Anojan on the street. Managing director Andrew Richardson said Anojan's challenging behaviour had put other residents in the home at risk. "In rare cases that may means that people need to move," he said. "This is just simply flagging that yes, we do need to change the situation. "We have never put anyone out on the street and we never will." House With No Steps received the largest share of contracts to run group homes in NSW under the State Government sell-off of disability services. Mr Richardson said the case did highlight his own concerns with the current system. 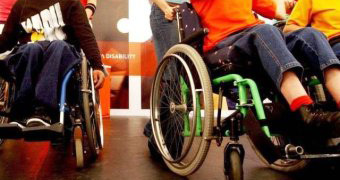 "With the State Government exiting from the role of market organiser and provider of last resort, we need the National Disability Insurance Agency to step up and take on that role, and that's something they haven't yet done." House With No Steps will take over care of 600 of the state's most needy people with a disability on October 1. It won contracts to run homes in five regions of NSW including Sydney, Southern NSW, Illawarra, Northern NSW and New England. Ms Letchumykanthan said she also had concerns about a series of incidents at the western Sydney group home. 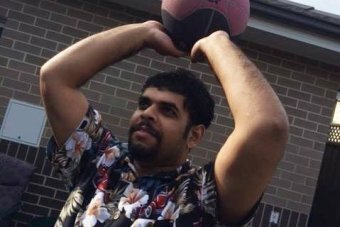 In one incident, which was reported to the NSW Ombudsman by the provider, Anojan was splashed with water as a form of "behaviour management" when he refused to leave another client's bedroom. "They threw water on him to scare him to move out of the room," Ms Letchumykanthan said. "You don't treat another human being like that." There was another case reported to the NSW Ombudsman of other clients in the home being hosed down as a behaviour management tool. Ms Letchumykanthan said she had also been told her brother had been restrained at one point when a staff member used an exercise ball to push him against a wall. "They treat him like nothing, he means nothing, his life means nothing," she said. Mr Richardson said the organisation self-reported these incidents to the NSW Ombudsman, who found they followed processes. "In rare cases where there's a concern or an issue we do investigate thoroughly," he said. "If there's a need to report to the Ombudsman we do that rigorously and as a matter of course, and we always will take appropriate action." Ms Letchumykanthan said she was told by both the State Government and NDIS they could not help her. The NDIS has previously said it would resume responsibility for tough cases, but Ms Letchumykanthan was told "they do not take on the responsibility for finding Anojan alternative accommodation". This is the direct opposite of what a spokesman for the National Disability Insurance Agency told the ABC, who said it "was prepared to act to reinforce thin markets where intervention is necessary to ensure market supply". NSW Minister for Disability Services Ray Williams left it to the Department of Family and Community Services to answer the ABC's questions. A department spokesman said "the National Disability Insurance Agency are the provider of last resort and are responsible for finding alternative accommodation solutions".